The book is the result of a British Academy-funded research project which investigated and compared the relevant law of England and Wales, Australia, Austria, Belgium, France, Germany, Ireland, the Netherlands, New Zealand, Scotland, Singapore, Spain, Sweden and the jurisdictions of the United States. In addition to chapters on these jurisdictions, the book includes a chapter on the 'English practitioner's view'. 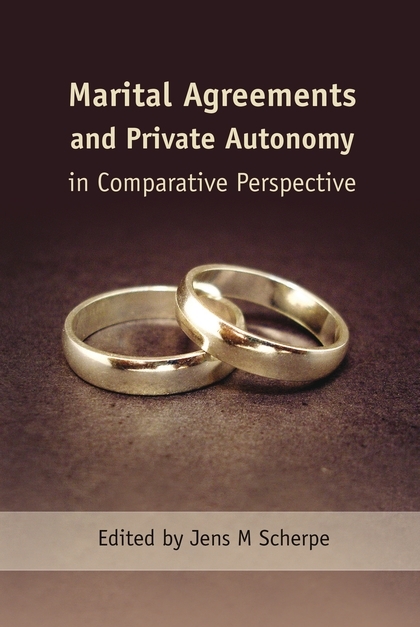 It also provides a comparative analysis of the different matrimonial property regimes and the rules on marital agreements that explores underlying themes and principlesand makes recommendations for regulating marital agreements. A key theme is the function and effect of marital agreements in the different jurisdictions. Thus, each chapter first explains the underlying 'default' rules for ancillary relief/matrimonial property and maintenance. 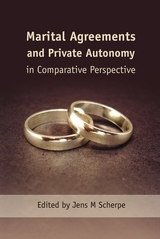 It then analyses the current rules for marital agreements, and gives a brief account of the private international law rules. The book provides a comprehensive source of reference on ancillary relief/matrimonial property and maintenance and the rules on pre-nuptial, post-nuptial and separation agreements in 14 jurisdictions. It offers guidance for academics and practitioners dealing with international matters, and a basis for discussions on law reform. I hope that judges, lawyers and members of the public read this book widely. It's thoroughness and clarity as to what the choices are means that it will be the leading book to refer to whenever the scope of marital agreements are debated in the courts. “...a comprehensive source of reference on marital agreements and the default system regulating the financial relations between the spouses in no fewer than 14 common law and civil law jurisdictions. Both the editor and the contributors understand the art of providing a detailed insight into this issue, ever mindful of the relevant socio-economic and legal context but without loss of clarity. The result is a book that achieves the highest scholarly standards but reads like a novel: a rare and valuable combination. Excelling in both quality and clarity [the book] aims to provide guidance for academics and practitioners alike and will soon prove to be the reference work par excellence on this topic. Jens M Scherpe is a University Senior Lecturer in Law, University of Cambridge and an Academic Door Tenant, Queen Elizabeth Building, Temple, London.